"I take my position as a Trustee for Westchester Community College very seriously and work hard to help fulfill the college's mission to provide high quality, low cost education to meet the career, transfer, remedial, vocational and recreational needs of the Westchester Community. We are accessible, adaptable and dedicated to lifelong learning and sensitive to the individual needs of our diverse population." Westchester Community College is one of 30 community colleges affiliated with the State University of New York (SUNY). Founded in 1946 as the New York State Institute of Applied Arts and Sciences, it first opened its doors in White Plains. In 1957, the County of Westchester bought the 360-acre John Hartford Estate in Valhalla, three miles to the north, and designated 218 acres as the relocation site for what would become Westchester Community College. 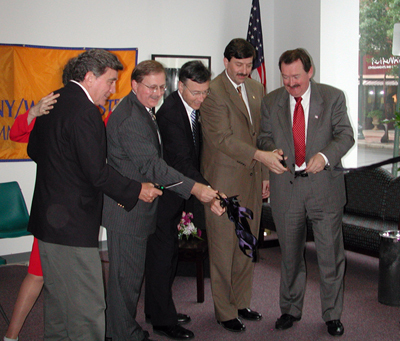 By 1988 eight major buildings were constructed and in 2002 the new Harold L. Drimmer Library and Resource Center was opened. In 2010 the new Gateway Center will be complete and house a unique learning center for multi-cultural, language, business and international students. Hartford Hall, a beautiful English Tudor manor house of the John Hartfords, was completely renovated in 1990 and has been listed on the National Register of Historic Places since 1978. Hartford Hall now houses the offices of the College President, Deans of Academic Affairs and Student Personnel Services, and the offices of College-Community Relations and the Foundation for Westchester Community College. In addition to its beautiful campus, Westchester Community College offers credit programs at extension sites throughout Westchester County. Classes are offered in Mahopac, Mount Vernon, New Rochelle, Ossining, Peekskill, Port Chester, Shrub Oak and Yorktown. A division of WCC called the Westchester Arts Workshop operates out the County Center building in White Plains. County Executive Andy Spano, County Legislator George Oros, College President Joseph Hankin, Peekskill Mayor and WCC Trustee John Testa, WCC Board of Trustees Chairman Tim Carey at the opening of the newly expanded Peekskill Satellite campus. The Peekskill satellite for Westchester Community College is located at 27 North Division Street in downtown Peekskill. As the the college's most successful satellite, the Peekskill campus offers day and evening general education courses. With state-of-the-art fully equipped labs the site offers a full range of digital music, video and web design courses. In 2003 the center was doubled in size from 10,000 to 20,000 square feet with the addition of second floor classrooms and student lounge. The expansion enabled additional class offerings which enable more local students to access quality education.